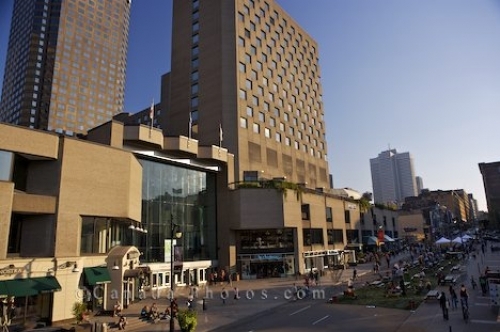 The Complexe Desjardins makes up the beauty of the Rue Sainte-Catherine in downtown Montreal, Quebec where hundreds of people stroll the street on a daily basis. Inside the Complexe Desjardins, one will find over one hundred restaurants and stores. The shopping centre is also home to a grocery store which encompasses a public square. The square holds events all year which brings out crowds of people with an easy access directly to the Hyatt Regency Hotel. Complexe Desjardins along Rue Sainte-Catherine in downtown Montreal, Quebec, Canada. Picture of the exterior of the Complexe Desjardins in downtown Montreal, Quebec where shopping is at its best.